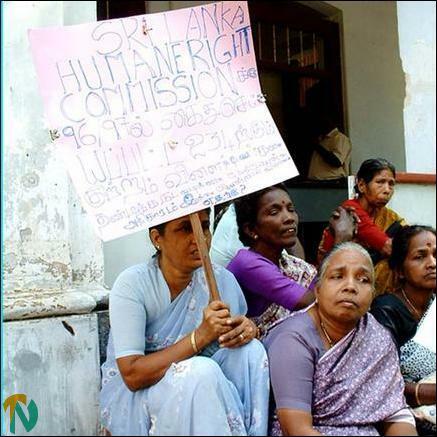 They condemned the inaction of the HRC despite persistent appeals by the Jaffna Mothers’ Front and the Missing Persons Association. The parents of the missing, mostly mothers, sat in protest with placards at the office of the HRC on Somasunderam Avenue, near the District Secretariat in Jaffna town. 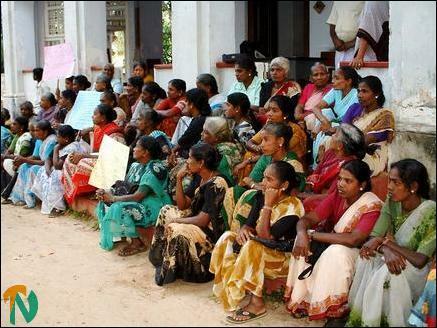 The protesting mothers of the missing, at the HRC office in Jaffna. In a special memorandum to the European Union, the two organizations state that they had met Sri Lanka’s President Chandrika Kumaratunga and that she had assured them during the meeting only 18 of those arrested by the Sri Lanka army had been killed by the military. The president had stated that she would take responsibility for finding out the fate of the other missing persons. The memorandum states that the two associations had discussions with the Secretary to the Prime Minister, the secretary of defense, the secretary of the ministry of rehabilitation and reconstruction and Jaffna Tamil National Alliance MP Mr. M. K Sivajilingam after the ceasefire agreement between the Liberation Tigers and Colombo was signed. It had been “resolved” at the discussion that the SLA commander for Jaffna at the time, Major. Gen. Janaka Perera (Sri Lanka’s High Commissioner in Australia now), would be called and an “inquiry must be held in (sic) regard to missing persons”, according to the memorandum. It had also been agreed at the meeting that the Government of Sri Lanka (GOSL) would look for the missing persons who are still unaccounted for in detention centers and prisons in the southern districts of the island and that if anyone were to be confirmed dead GOSL would pay five million in compensation to his/her next of kin, according to the memorandum. None of the pledges made by the President and the GOSL have been honoured, the protestors said.